The so called Circle of fifths is what you will 'discover' when you start experiencing the question and answer, tense and release feeling of a dominant-seventh chord resolving to its corresponding tonic chord. Each step to the left on the circle represent a musical fifth (7 semitones) and represents the strong pull of harmony in that direction. 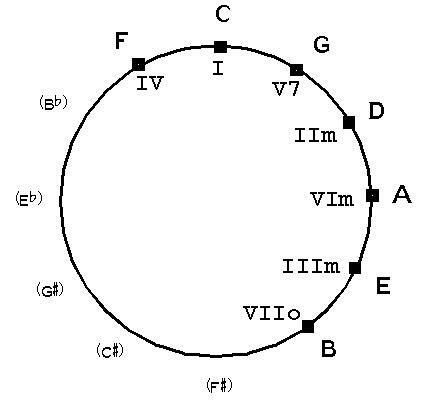 In the diagram above the circle was rewritten mentioning the stage within the major scale of C using seven stages C D E F G A B. 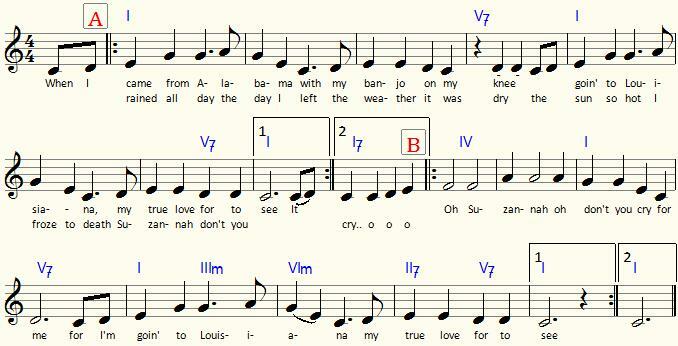 Take a close look to the chords in the song below. It starts with the C chord (stage I) and moves on to the G7-chord (stage V) as soon as the chord on I does not 'fit' anymore. One bar later we're back at I; the G7 pulls strongly back to the C-chord, we're at home again.The melody alters a bit and the chord sequence C G7 C repeats. The [A] part repeats, using two more C G7 C chord sequences. Then (at o-o-o ) The C-chord is replaced with a C7 that very strongly pulls to the F-chord. In many songs the the chord at stage IV - left of stage I on the circle - is the chord needed to complete the minimal harmonization of most songs. Two bars of F and one more C G7 C sequence later we meet a Em-chord (as replacement of the simpler G7) and a sequence Em Am D7 G7 C. Wow! On the circle you see a journey of counterclockwise steps known to pull the melody inescapably forward to the end. Looking carefully to the chords of catchy melodies (like many evergreens), you will find heaps of sequences like this one. Tricks and treats of the Circle of fifths. The chords left and right of any point of the circle are the 'main' chords of the key. 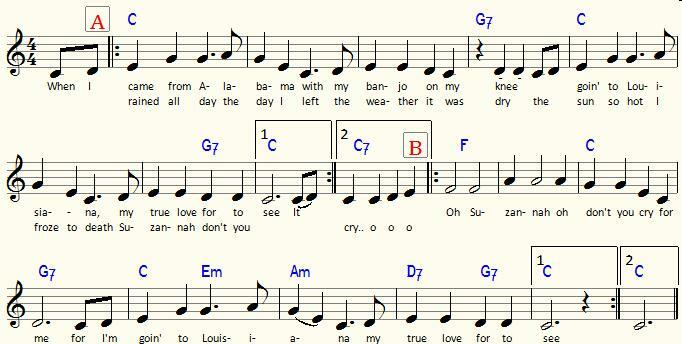 In C-major they are with the obvious C: G(7) and F. In E-flat major chords are: Eb Bb7 Ab. In the key of B the are B F#7 E. and so on. The chords immediately clockwise from the three main chords IV I V7 are the relative minor chords IIm VIm IIIm. If you need more than the main major chords, here they are for use. Each major key has a relative minor key a quarter to the right: the relative minor to C is Am the relative minor to Ab is Fm etc. In general the releative minor to I is VIm Both keys use the same accidentals, for instance, both G-major and E-minor use one sharp. Minor and major keys of the same note (D and Dm, A and Am) are located a quarter of a circle apart, and thus any major key has three sharps more than the corresponding minor key. A-major has 3 sharps, whereas A-minor has none, D-major has two sharps whereas D-minor (with its relative major F) has one flat (adding a flat equals removing a sharp). Each whole step up (one whole tone) is two steps clockwise and thus adds two sharps (or removes two flats- boils down to the same thing). 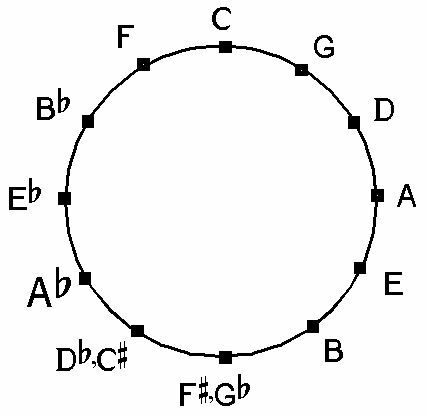 If you need to transpose a tune (and its chords) just look at the Circle of fifths... Transpose from F to D means three steps clockwise, so a Bbm6 in our new key will become Gm6 etc. In MusiCAD you'll encounter the Circle of fifths when transposing a tune. The chord wizard also uses the Circle of fifths behind the scenes.